Xcacel Beach and its proximity to the casita is what makes this place so special. What was once a great, little secret is now a place that we feel protective of and is near and dear to our hearts. Once you visit and learn about the importance of this precious gem, you too will feel the same way. This beach gained federal protection status as it is the largest and most important turtle nesting beach in this area. Many organizations are still fighting to save the turtles and keep these nesting areas sacred. You can get involved and learn more about the Sea Turtle Restoration Project. This beach has recently been voted one of the 10 most beautiful beaches in Mexico! Let’s continue efforts to keep it that way! Xcacel Cenote – To get to the cenote walk out to the beach and go south [to your right]. You will see a path that leads into the jungle. Follow this path into the jungle and you will find the cenote. It is a short walk, 5 minutes or so. You can swim and snorkel here. Weekdays you may still find the beach fairly deserted. You can snorkel at the north end of this beach, but if there are any waves, I’d only recommend it for advanced swimmers as the tide can move briskly. Enjoy the waves by boogie boarding or bodysurfing. 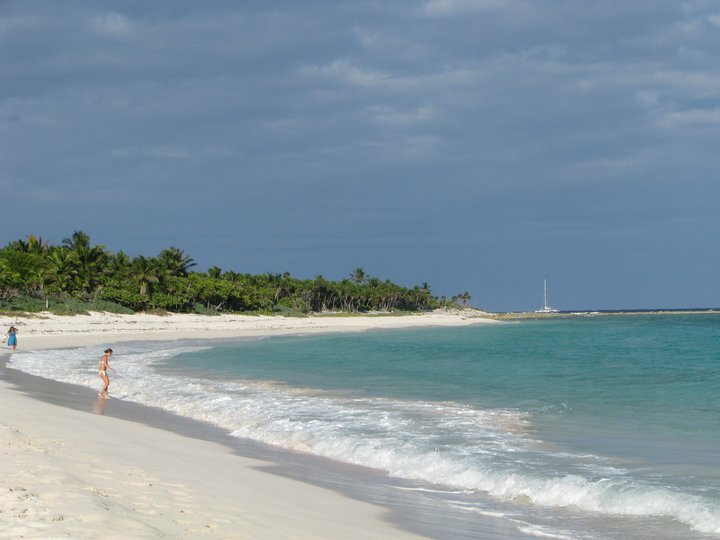 Walk south along the shoreline and you’ll find Xcacelito beach around the bend. Lots of rocks along the shore provide a nice place for birds. I’ve see osprey and pelicans here in the early morning. Don’t forget to bring $10 pesos per person for entry onto the beach. 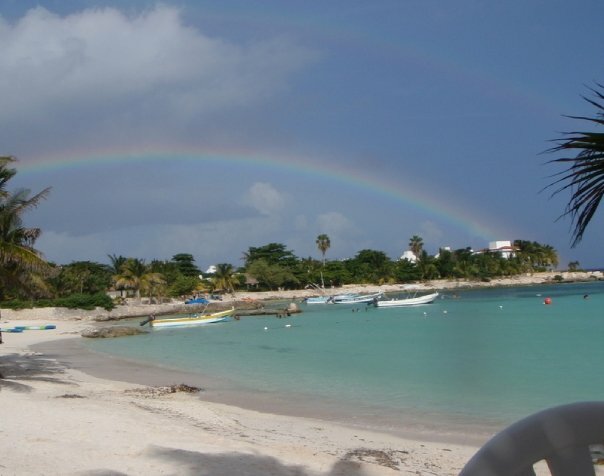 Akumal Bay is a beautiful place to come to relax, snorkel and enjoy an entire day of activities. Drive or take the colectivo to this little gem of a bay, just 10 minutes away. It boasts some of the best shore snorkeling around, especially if you want to see turtles! Akumal literally means “place of turtles” and these endangered creatures will take your breath away when they swim up and look you in the eyes! 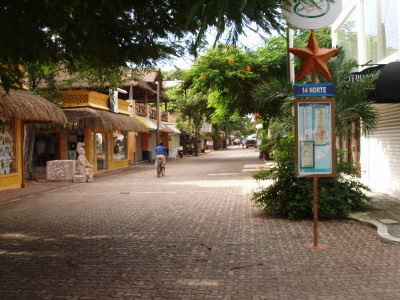 There’s great restaurants both on the beach side and in the pueblo. Lucy’s (just behind the store near the arch) serves us wonderful shrimp tacos and delicious ice cream! La Cueva del Pescador is a great place to enjoy arracherra, lobster and delicious margaritas. Turtle Bay Café is the place for breakfast. Enjoy fresh baked goods, a hearty breakfast and free WiFi. Then stake your place on the beach under a palm and enjoy a splendid day here. You can rent loungers at the Lol Ha restaurant and order lunch and drinks, or you can bring your own cooler. There are cute little shops here and you’ll find authentic Mexican art, unique souvenirs and gifts to take home. You will also find a couple of dive shops where you can rent equipment, schedule snorkel and scuba dives as well as fishing trips. During turtle nesting season (May – September) you can arrange a late evening walk with and experience the beauty of nature and witness giant sea turtles laying eggs and little hatchlings being released to the sea. 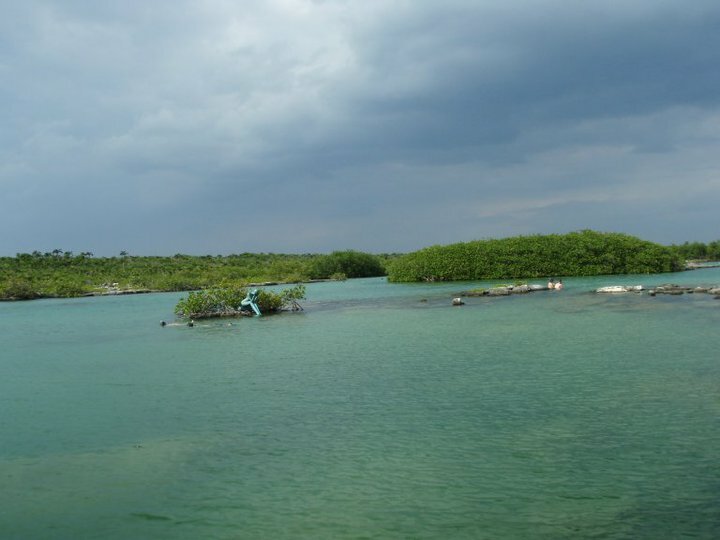 Yal-Ku Lagoon is located in north Akumal. It’s about a 10 minute drive to reach the lagoon. We have snorkeled this lagoon extensively on several occasions. We’ve seen turtles, rays, barracudas, parrot fish and a host of other interesting sea creatures. What makes Yal Ku Lagoon so attractive is that during rough sea-days when the water is too rough in the bays you can visit Yal Ku, which is protected from the main body of water and remains calm. 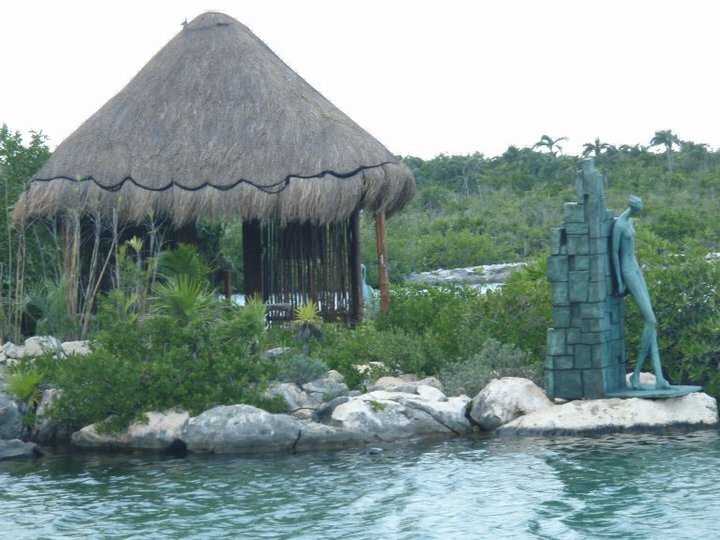 The grounds surrounding the lagoon have been manicured with paths, waterfront benches, palapas and statues. To help get into the lagoon, there are platforms and stairs in the water for easy entering and exiting. The water is about 6 – 15 ft. deep so you can feel comfortable knowing you are not in deep sea. This makes it comfortable for children, first-timer snorkelers and people who aren’t strong swimmers. The lagoon is quite protected from sea and there are no waves here. Another interesting feature is the underwater landscape, which is quite fascinating as you can see underwater caves and mini valleys. 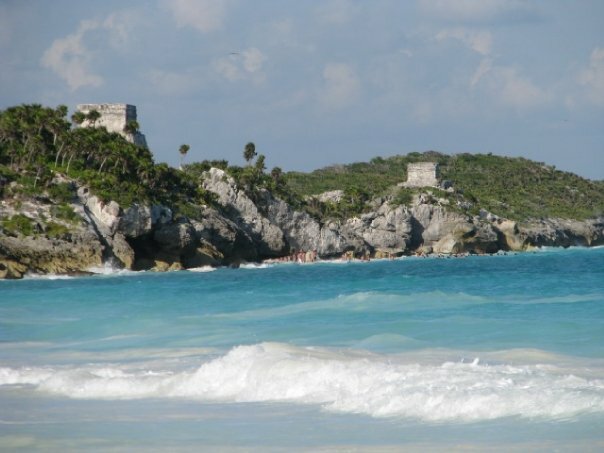 Tulum means the “walled city” in Maya and is located just 9 miles south of Chemuyil. The ruins, although not the most visited or largest in the Yucatan, sit high up on a cliff and have the most spectacular view overlooking the Caribbean and an amazing beach with stairs going down to it. The pueblo or town of Tulum is just another mile or two south and has many great restaurants, Mexican arts and crafts, funky and chic shops as well as a new and modern Chedraui grocery store. Head to the long winding beach road that runs north and south for a wide array of eco-resorts and cabanas, restaurants and fabulous and hip beach clubs……..all along some stunning beaches! At night, you’ll find live music many places and if there’s a new moon you’ll see the most amazing night sky in the world, full of twinkling stars! A full moon lights up the entire beach! 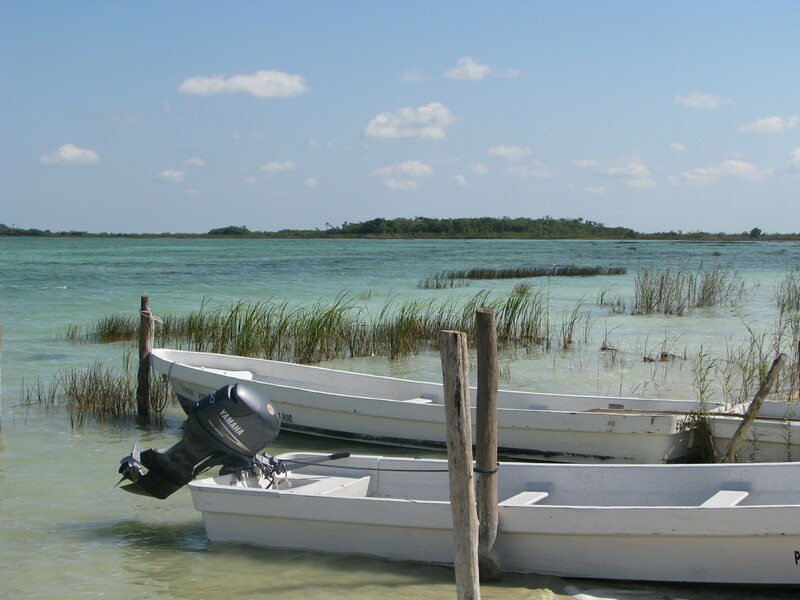 Muyil and Chunyaxche are located on the outskirts of Tulum. Spend an hour or two walking around the ancient ruins and have a picnic lunch at the lagoon. You can even hire a boat here to take you on a tour of the lagoon. 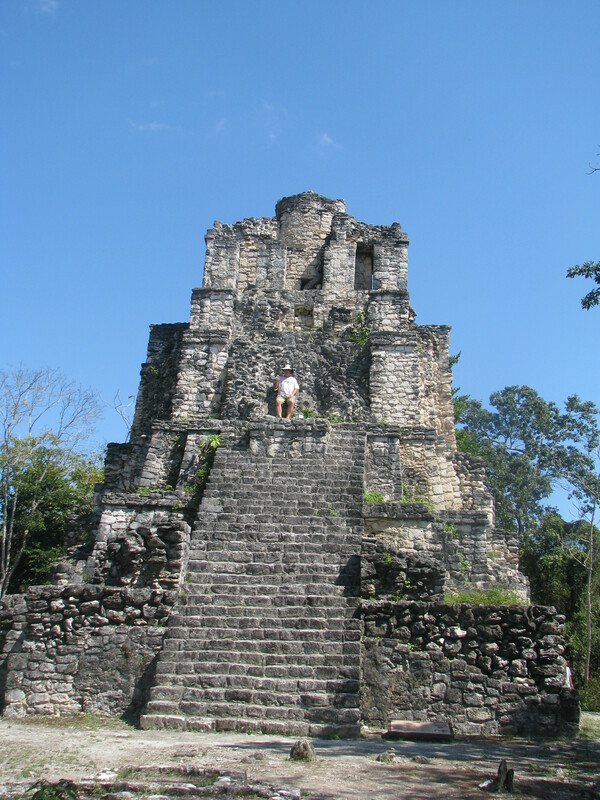 The ruins of Chunyaxché are situated in the Pueblo of Muyil and at one time the ruin was named Muyil but has recently changed. All recent guide books use the name Chunyaxché. The lagoons that border the ruins have a canal dug by the Mayans that connect them with the Caribbean. While not very spectacular, its a nice day trip from the casa. It sits on the edge of the Sian Ka’an and you very likely may have this little known ruin to yourself. Be sure to wear your mosquito repellent when visiting the ruins. Located 14km south of Tulum, the ruins are on the left side of the highway. The entrance to the lagoon and park are 1km south of the ruins. Playa del Carmen is just 30 minutes away. For a more cosmopolitan experience, head north to this bustling little city, which is named the fastest growing in Latin America today! You’ll find the best grocery stores in Playa, in fact this is where we always stop on the way from the airport to do our big grocery shopping before heading to the casa. You’ll find lots of great shopping for Mexican arts and crafts, many wonderful restaurants (including a few American chains now) and lively beaches with clubs, hotels and restaurants lining the shore. Visit Xcaret, a unique archaeological site, water park with underground rivers and pools, butterfly exhibit, regional wildlife and nature and Maya civilization preserve theme park. Very well done family fun! Swim with dolphins, watch invigorating shows on the Maya and so much more. Across the street you’ll find a new theme park called X’Plor that has zip lines running across the jungle along underground rivers, cenotes and a lagoon the pours into the Caribbean. For information on tickets, visitXcaret, XelHa and X’Plor . For your convenience, we have compiled this resource section. Please refer to the links below, they will aid in your visit and information regarding the area. We keep a more extensive guest guide in the casa along with maps too. Please feel free to contact us if you have any questions that will help you plan your vacation in paradise! Visit Wikipedia for an overview of Quintana Roo, Mexico and all of the popular destinations within. Click on the “inside” links for more information about the many towns and villages. Visit Yucatan Living for more information about living and traveling in the state of Yucatan, Mexico. The state of Yucatan hosts one of the 7th wonders of the world, Chichen Itza. Afterwards, drive onto the beautiful, colonial city of Merida. Click here to check out our You Tube video and see the wonderful sights throughout Yucatan Peninsula and the Riviera Maya.